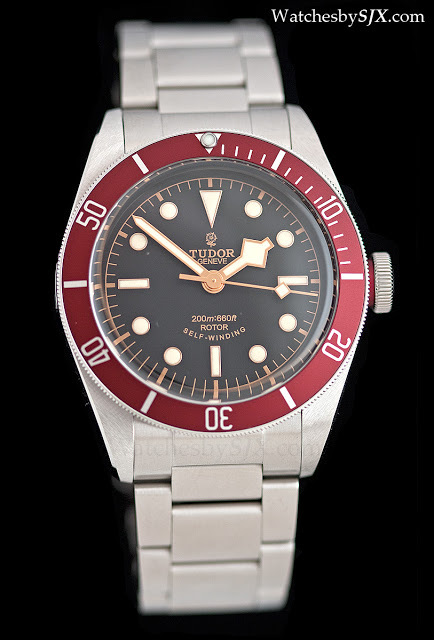 Tudor launched a pair of dive watches at Baselworld 2012, one of which is the retro styled Heritage Black Bay, ref. 79220R. 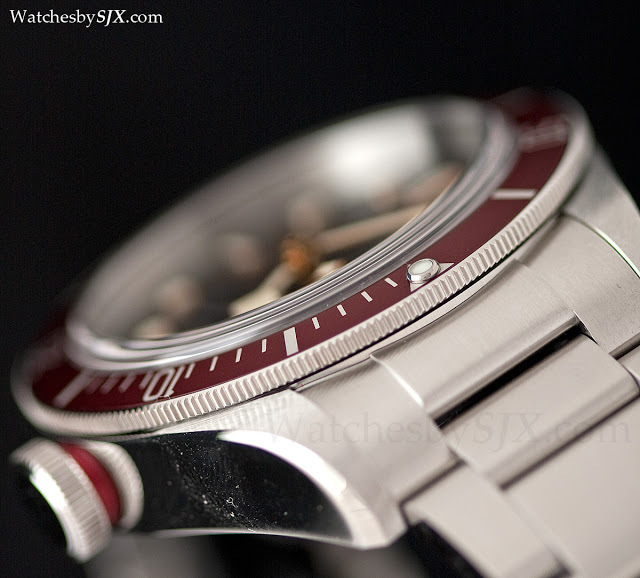 The other new diver is the 500 m Pelagos in titanium, ref. 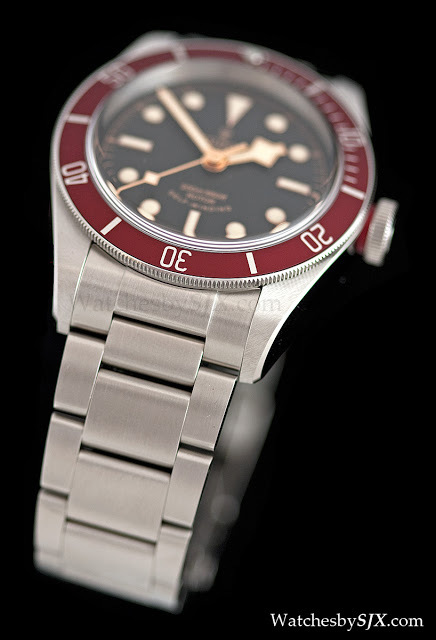 25500TN, with self-adjusting dive clasp. 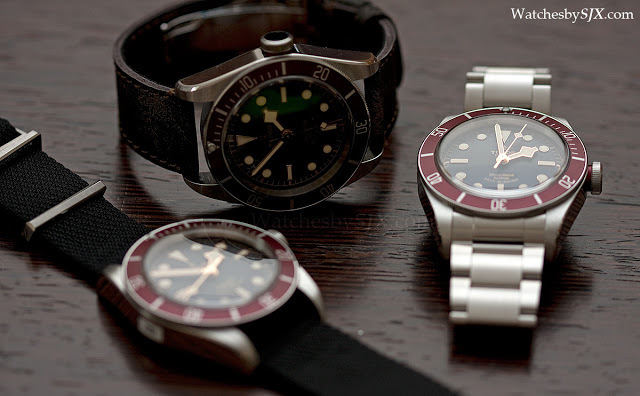 Both watches have received lots of positive attention due to their design and price. There was lots of anticipation building up to its release date. 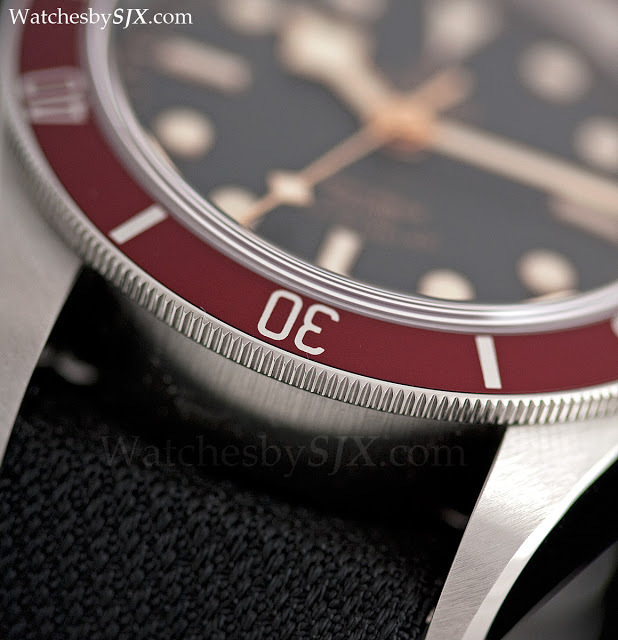 Finally the Black Bay is just being delivered now and is already selling briskly, as expected. 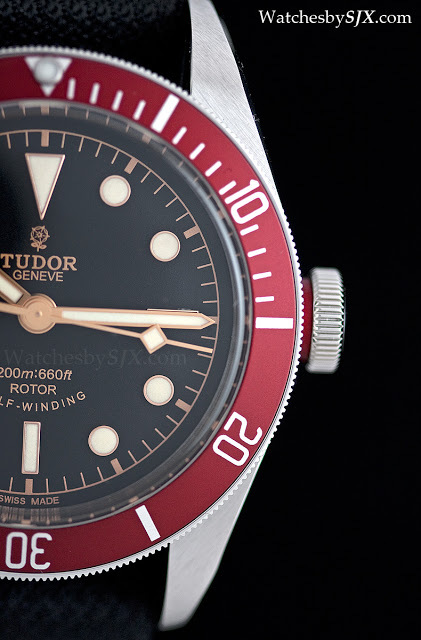 Unlike most vintage inspired watches, the Black Bay is not a faithful remake of any specific model, rather it has elements from various dive watches from the past. Despite being a mish mash of different models, the result is a compelling buy. 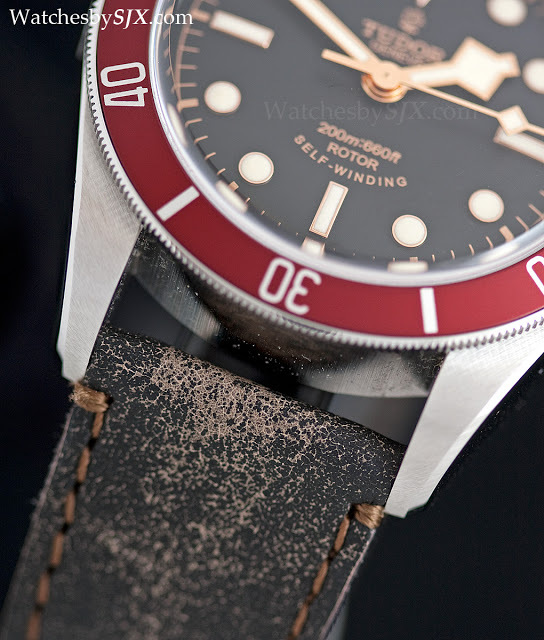 The Black Bay has all the right details that are most attractive in fifties dive watches, the gilt dial. 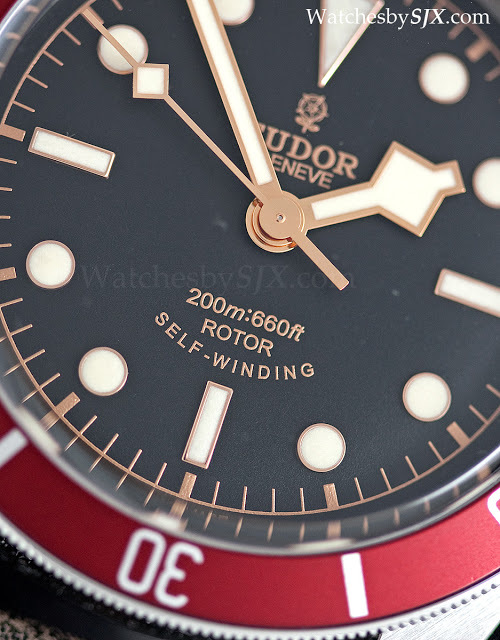 And it has Tudor’s trademark snowflake hands, plated in rose gold to match the dial. 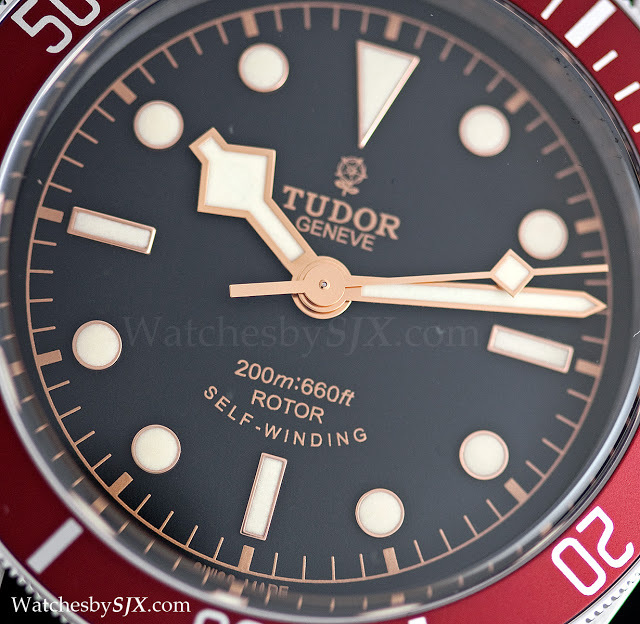 Together wih the red bezel this is a very distrinctive watch, which is an achievement for a traditional looking dive watch. 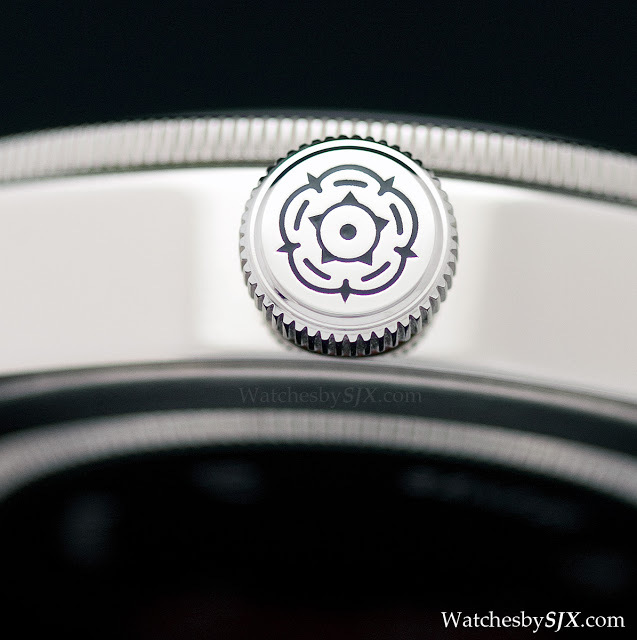 Another noteworthy detail is the slightly domed sapphire crystal, hence the slight distortion at the edges when viewed at an angle. 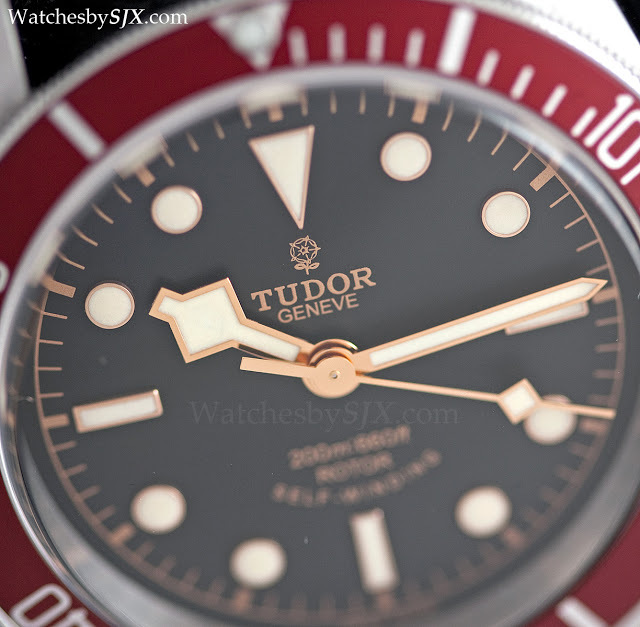 What gives away its modern origins is the red band around the stem of the crown. 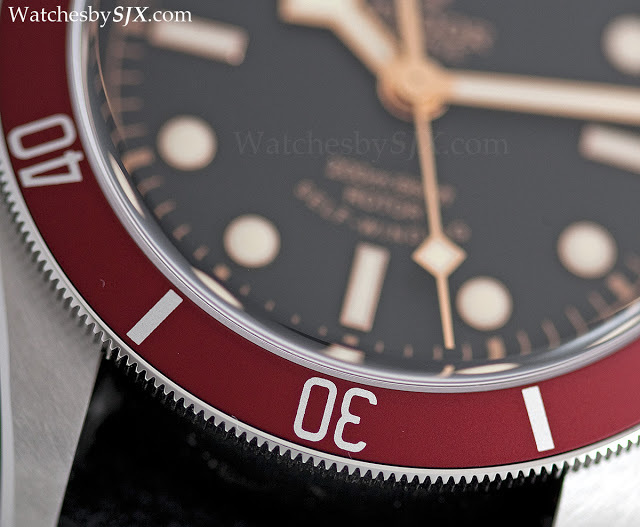 I don’t like this detail, it is somewhat incongruous with the rest of the watch, though it does not that bothersome since it’s a subtle detail. 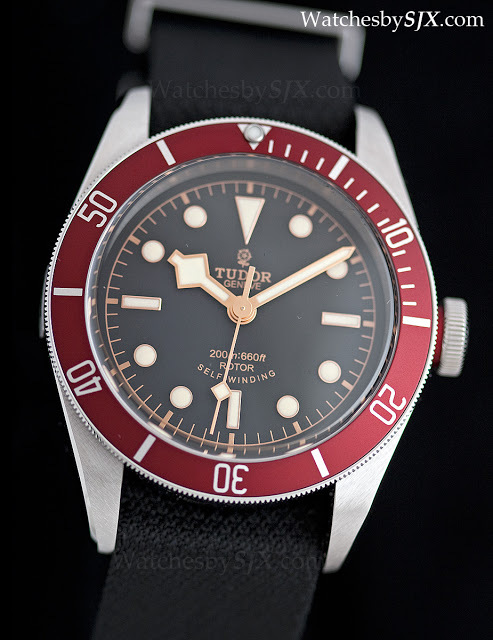 And of course at 41 mm the Black Bay a lot chunkier than its 39 mm predecessors. 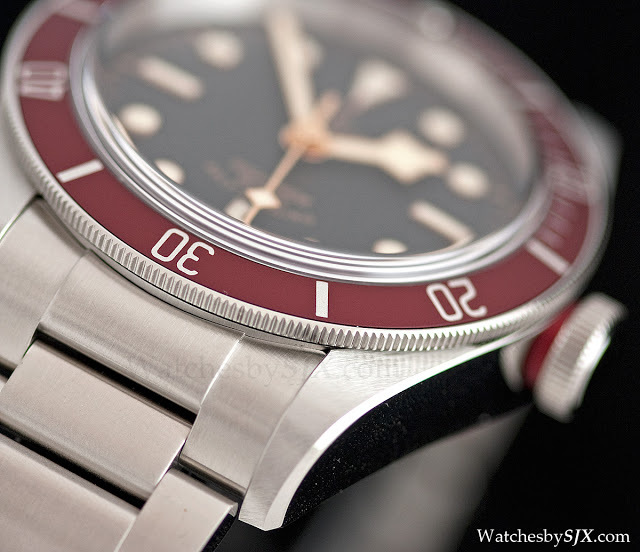 And on the bracelet – which has solid links and end-links – it feels solid on the wrist. 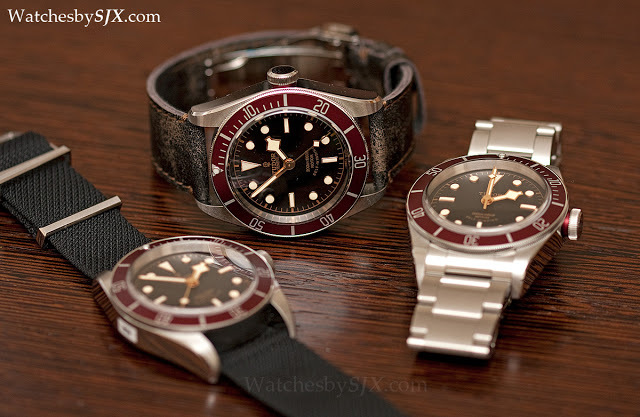 Like the other models in the Heritage series like the Heritage Advisor alarm, the Black Bay is available with a steel bracelet as well as fabric band (it comes with both), which retails for S$4550, about US$3600. 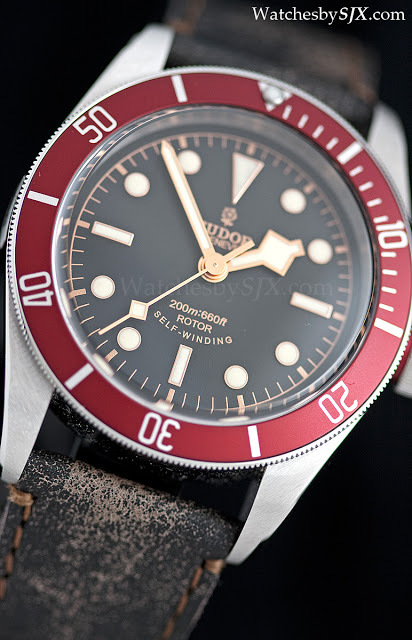 Note that the fabric strap is styled like NATO strap with a loop under the watch, but it is actualy uses the spring bars which run through the band to secure it. 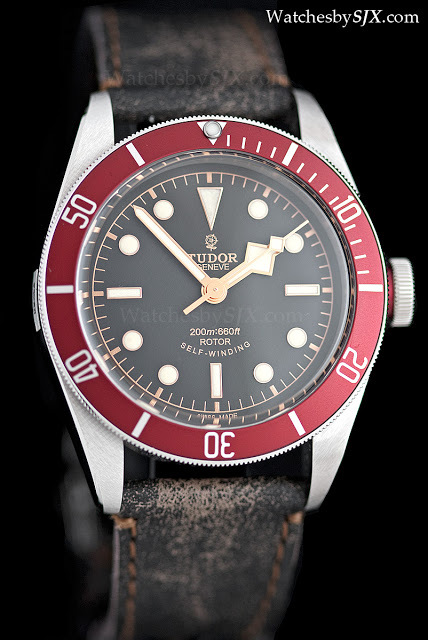 Another option is the aged leather strap and the fabric band, which is S$4130, approximately US$3260. 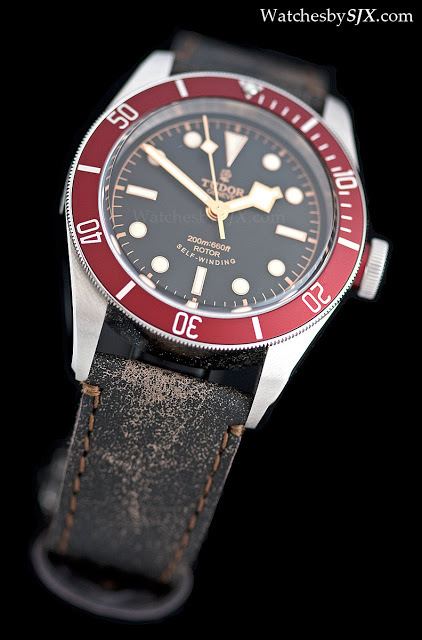 I instinctively like the bracelet version but the aged leather band really grows on you. 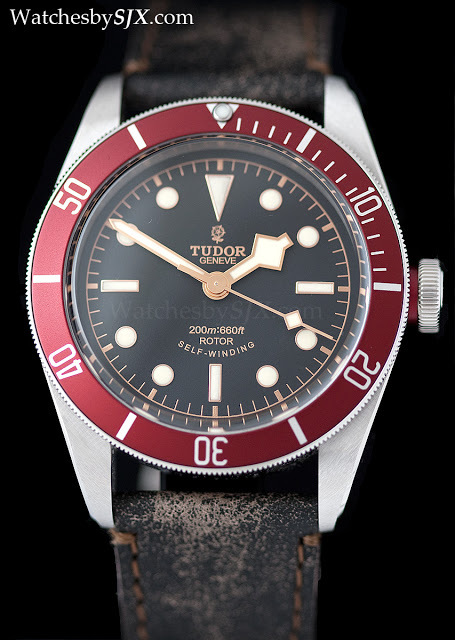 This watch is even more compelling than the Heritage Chronograph “Monte Carlo”, even though it’s a far less accurate historial remake. 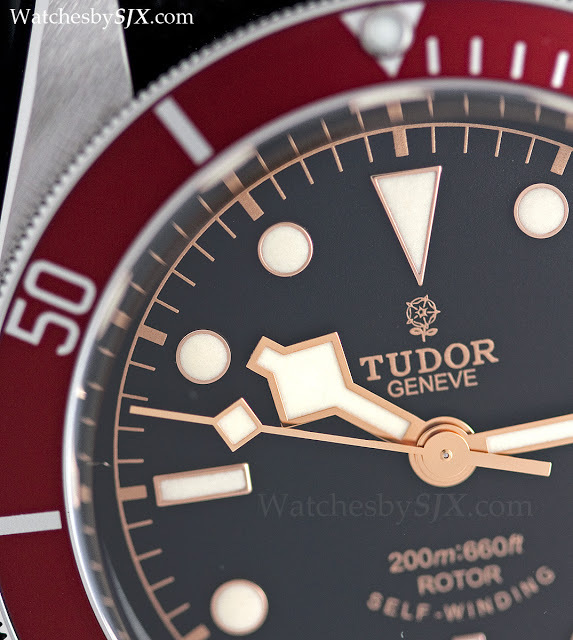 The Black Bay is well priced and a strong design, proving that the Monte Carlo was not a one hit wonder and that Tudor is on the right track. Enjoy the rest of the photos.